Fish Masala with Spiced Lentils, Lime Creme Fraiche. A delightful dish which makes a great meal at any time of day (well, perhaps not for breakfast). Fish can stand up really well to mild spices. Should you use any stronger spicing, this will dominate the fish rather than support it as in this recipe. Use a good fleshy round fish such as bream, cod or salmon. Choose your fish carefully and make sure it is supremely fresh, the best way to ensure this is to make friends with your fishmonger. If you don't have a fishmonger locally, then do check out my hints and tips on choosing and buying fish. 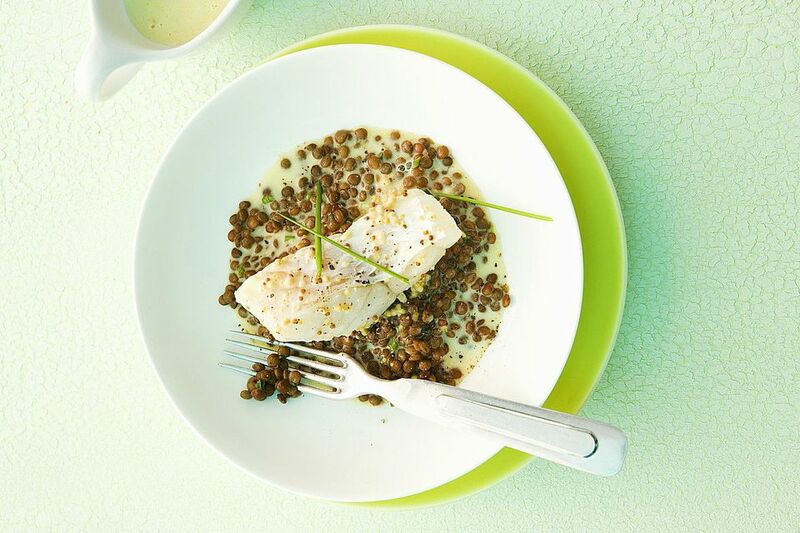 This Fish Masala with Spiced Lentils recipe comes courtesy of Cooks the Carlton School of Food in Yorkshire. Rinse the lentils in cold water. Dust the bream with the Garam Masala. Chop the onion, carrots, and celery into a small dice. Crush the garlic. Heat a little olive oil in a heavy pan and sweat the garlic and the onions. Add mustard seed cover pan and shake, now add carrot, celery and the remaining spices. Cook until the vegetables are translucent, then add the drained lentils and stir well. Add ¾ of stock or enough to cover leave on a low heat just simmering for 20 / 30 minutes until soft to the bite, occasionally adding stock if needed. Peel the cucumber into long, thin strips using a potato peeler. Heat a non stick pan until very hot and add a dash of vegetable oil. Grate the limes on a fine grater the add the zest plus the juice of the limes to the crème fraiche. Stir a knob of butter into the lentils and finally, add the chopped coriander. Check for seasoning. Place a good spoonful of lentils onto the plate, top with the fish and the cucumber in the centre of the plate and either drizzle with the crème fraiche or serve on the side. Introducing one of Britain's favourite curries, Chicken Tikka Masala. Chicken Casserole Does Not Come Quicker or Easier Than This.